Posted On May 22, 2013 by Team iCynosure. This Sunday evening on my way home from a weekend out with family, my phone beeped. 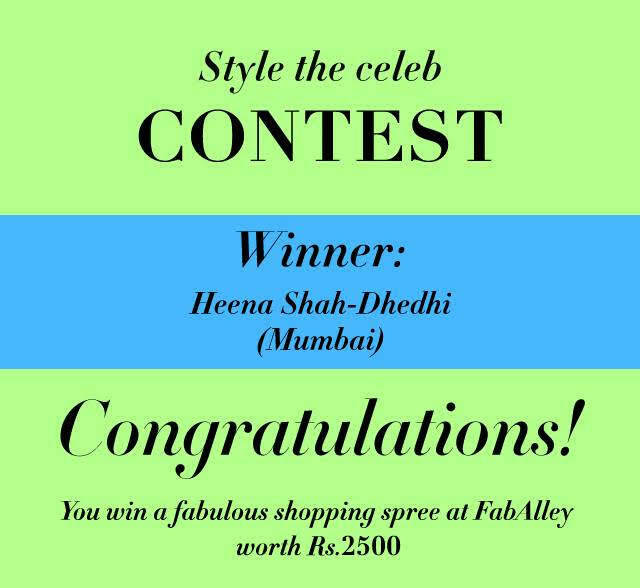 I checked and it was a message from a fellow blogger Megha Shrimali, tagging me to a contest celebrating FabAlley's First Birthday. 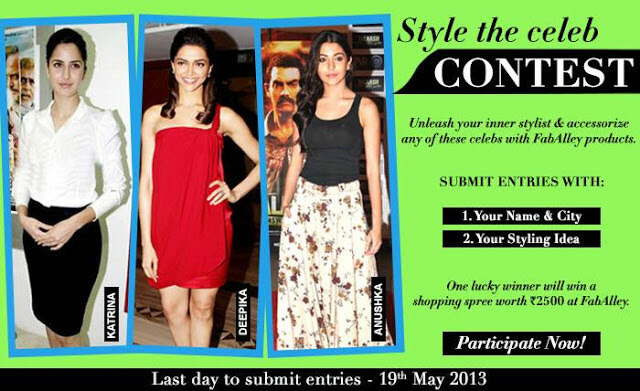 Scrolling forward I thought... "Style a Celeb" what a dream contest. However, time was running out as it was the last day and the watch was already ticking towards 8.30 pm. With three gorgeous B-town leading ladies in unaccessorised avatars, participants had to tread through FabAlley's collection of accessories and complete the look of one gorgeous girl to take home a fabulous voucher worth Rs. 2500. Of Katrina Kaif in a classic Black n' White formal outfit, Deepika Padukone in a glam red dress and Anushka Sharma in a boho maxi skirt, I chose none other than the stunning Deepika. Deepika Deepika Deepika ... What does one have to say about her – with a perfect body and a mesmerizing smile this heavenly beauty is capable of rocking any ensemble. Dressed like a diva in a little red dress, what I would prefer is to keep the accessories to a minimum, so she remains the cynosure of all eyes and the attention isn't diverted onto the accessories or the outfit. I gave her a Multicolour Gem Ear Cuff to add a little colour around the pulled back hairstyle. Instead of adding chunky bracelets or stacks of chain bangles, I preferred to add an elegant DKNY delicate gold watch. Nothing can beat the gorgeous Glitter Back Mary Jane Pumps that add some more height to the stunner. I also added a Gold Spike Bracelet at her ankle to give it an edgy yet coordinated look. And my dainty doll is ready to be the cynosure of all eyes and claim the title iCynosure. And I sent in my entry onto their blog at the nick of time... almost scampering as the clock struck 11.48 pm, just in time. Phew. And we won!! How would you have styled Deepika? Let me know in the comments below for I’d love to know.